A new website, TM.Biz, has been launched with the goal of helping trademark owners protect themselves in a sea of social networks. The service searches and monitors the 500 most popular social networks for occurrences of a trade name as a user name. It then provides detailed, downloadable reports of its findings. It will also reserve your trade name across all these social networks to block out others from registering it as a user name. The site is free to join and to search. Fees are charged for reports, watches and name reservations. More about the fees in a moment, but first here is an overview of how it works. The searches are in real time and take a few moments to run. 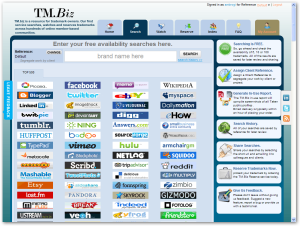 Once you run a search, TM.Biz caches it for 24 hours so that you can return to it more quickly. If I want more details, I can order a search report. Two kinds are available. The basic report lists all the sites where the name is taken, all the sites where it available, and all the sites that listed the name as unacceptable or restricted for some reason. The next-level report, called an In-Use Report, shows this same information, but adds to the mix screen captures showing the actual use of the name on the site, generally by showing the profile associated with the name. The cost of a report depends on the number of results you want. 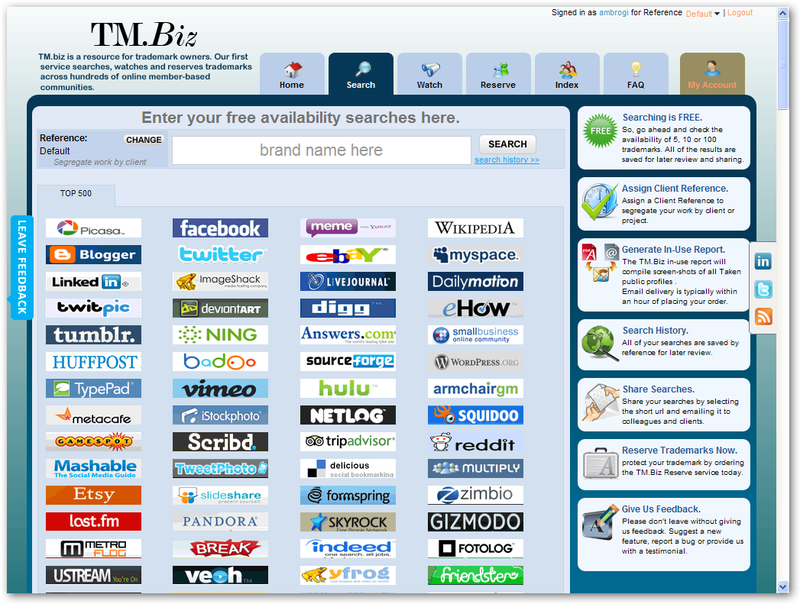 For the top 50 sites, the basic report is $29 and the in-use report is $99. For the top 100, the prices are $49 and $199. The most expensive is the top 500, at $199 for the basic report and $599 for the in-use report. A second service the site offers is to watch these networks for your trademark. It offers packages by which it will check for your name monthly, twice a month or weekly. The cost of these watches ranges from $99 a year for a monthly watch of the top 50 to $459 a year for a weekly check of the top 500. The final service the site offers is name reservation. It will register your name for you at the sites where the name is available. Again, this is priced by the number of sites: $199 for the top 50, $349 for the top 100, $599 for the top 250, and $999 for the top 500. Rush prices are available. When you order the reservation service, TM.Biz creates a unique e-mail address and inbox for the name. This keeps you from being flooded with e-mails from hundreds of social networks. You can read them if you choose, but you need not. The actual process of registration at all these sites is done manually, so it can take anywhere from hours to days, depending on the number of sites at which you choose to register. The registrations are made through TM.Biz and do not show your name. Although registration is free, access is limited to trademark professionals and trademark owners. The site is owned by EnCirca, an ICANN-accredited domain name registrar. The company president, Thomas Barrett, is a former vice president of the trademark research company Thomson & Thomson, where he was responsible for the development of the SAEGIS trademark research platform.